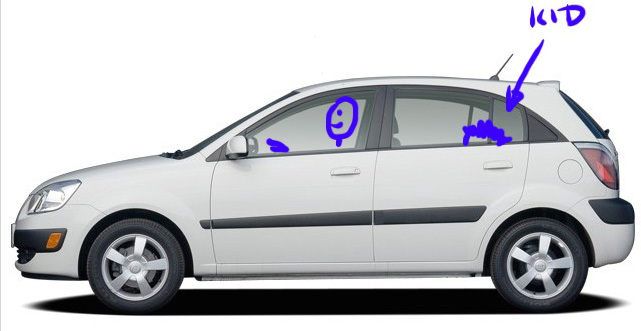 I have been puzzled by the styling of new cars in the past few years, which appears to shrink rear passenger windows. Take for example this 2012 car (Kia Rio), relative to its 2008 version (which already has a smallish rear passenger window). Perhaps the styling around the side view mirror is playing visual tricks on me and there hasn’t been much change 2008-2012. However, one thing I’m sure about is that the 1991 Honda Civic (arguably the best car ever designed and built), is positively an aquarium relative to the newer models. I can think of 2 reasons for this development: fashion and safety. I sincerely hope it is fashion, because fashions come and go, but boring safety is always there to stay. And in this case it really is boring. A small boy who loves cars, trucks, and buses, but rides in a newer model car, only has a chance to see the occasional airplane or tree/bus/truck tops.